CHICAGO — In the spirit of some well-known fourth-quarter holidays, this month’s American Drycleaner Your Views survey asked dry cleaners about their most frightening management scenario as well as aspects of their operation for which they are most thankful. 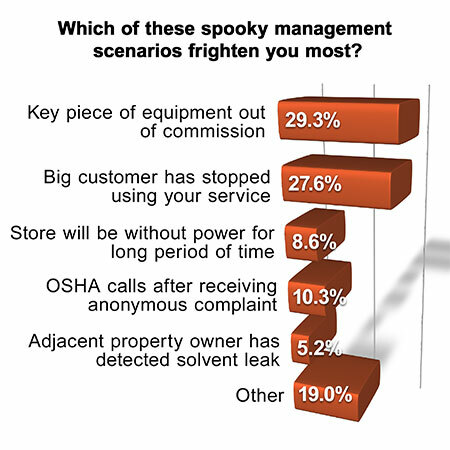 The majority of dry cleaners polled (29.3%) regard a key piece of equipment going out of commission as the most frightening management scenario, but a “big customer” no longer using their service wasn’t far behind in the voting (27.6%). Among other scenarios that frighten dry cleaners include: “OSHA calls after receiving an anonymous complaint” (10.3%); “Store will be without power for a long period of time” (8.6%); and an “Adjacent property owner has detected a solvent leak.” (5.2%). Nearly one-fifth of respondents selected “Other,” elaborating that instances such as the departure of a key employee, a break-in, a workers’ compensation lawsuit or a major new construction project beginning on adjacent property would be their nightmare. In light of Thanksgiving, American Drycleaner posed some questions with thankfulness in mind. First, it asked if respondents agreed with the following statement: “I’m thankful because our operation is performing well.” More than 79% of respondents said they agreed, while 12.1% said they disagreed. The remaining 8.6% were unsure. Another statement: “Our equipment works well and isn’t a concern.” The level of agreement was much less concentrated. Roughly 25% “Completely agree” with the statement and another 45.6% “Somewhat agree.” Much smaller shares “Neither agree nor disagree” (19.3%), “Somewhat disagree” (8.8%) or “Completely disagree” (1.8%). 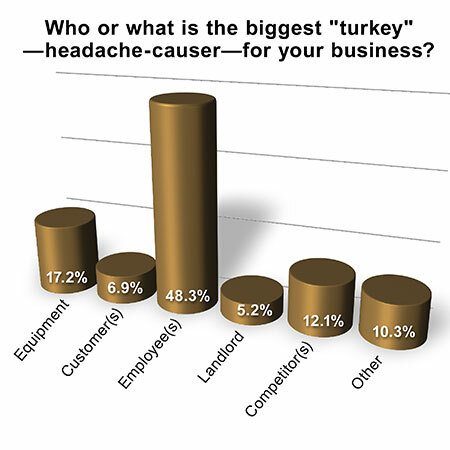 Who or what is the biggest “turkey”—headache-causer—in your drycleaning business? The top pick among survey respondents is “Employee(s),” at 48.3%. Others are “Equipment” (17.2%), “Competitor(s)” (12.1%), “Customer(s)” 6.9%, and “Landlord” (5.2%). The remaining 10.3% of respondents selected “Other,” but the specifics were often a variation on the theme: “bad employees,” “customers, but a lack of them,” etc. And at least one respondent couldn’t pick just one: equipment, customers and employees all gave them a headache. The magazine also asked respondents to name one aspect of their business for which they are most thankful. The most popular responses related to loyal customers and good employees. The Your Views survey presents a snapshot of readers’ viewpoints at a particular moment and should not be considered scientific. Subscribers to American Drycleaner e-mails are invited each month to take a brief industry survey they can complete anonymously. Percentages may not add up to 100% due to rounding.